When it comes to drivers, it’s no secret that Radeon HD Catalyst center isn’t always perfect. Well, guess what? We’ve heard that some of the guys at AMD are not happy with the current state of drivers as well. Actually, they have decided to do something about them and that is: completely rewrite its Catalyst drivers suite ala code them from scratch. Although there are no known ETA’s and the current state is unknown , we can only make a guess that it could potentially be revealed on CES 2011 (January 6-9) or even earlier. 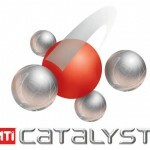 AMD: New GPU Family in Early 2011?